dred acres in the Eugene Hilton farm, which is one of the choicest in Merrick county, finely located and well equipped. Mr. Hilton from his boyhood days has seen the marvelous changes from a barren country, peopled by Indians and venturesome pioneers, to the present highly civilized and cultivated country. Merrick county, which was no exception to the rule, is now a great farming and stock county, but Mr. Hilton knew it when it was in its sandhill days, and in the days of the Pawnee, Sioux, and Cheyenne Indians. Mr. Hilton was married to Miss Helen Groves, March 31, 1869, in Ashland, Nebraska. The Groves family came to Sarpy county, Nebraska, in 1859. Mr. and Mrs. Hilton have had six children born to them, five of whom are living: John, who resides at home; Minnie, married to Mr. Frank Moore, has three children and lives five miles northwest of Central City on the old farm; Guy, who lives under the parental roof; Raymond, deceased; and Fay and Verne, who reside at home. The Hilton family are well and favorably known, enjoying the respect and esteem of a very large circle of friends. Mr. Hilton is a self-made man who has had responsibilities since his twelfth year, and is known for his sterling qualities. The west offers opportunity to the ambitious who have the desire to make fortune and place for themselves, and of these, none can be more fitly termed "self-made" than the genial gentleman above mentioned. Fred Opocensky was born in the village of Valterice, Bohemia, on February 18, 1862, and was but a small lad when his parents, Joseph and Franciska Opocensky, emigrated to America, sailing from Bremen on the steamer Albio, and landing in New York after a voyage of twelve days. The father was a linen weaver in his native land, but on arriving at Chicago, their first stopping place, he was unable to find work at his trade, so was employed in various lines there until his death, which occurred in 1883, in that city. When Fred was only about nine years of age, he came to Nebraska in company with a brother-in-law, who settled on a homestead near where Verdegris now stands. There they went through hard times, often being actually without the necessaries of life and suffering from insufficient food. Our subject experienced the pangs of homesickness, knowing that with his parents he at least would have plenty to eat, and after holding out for two years, he finally got his courage up and ran away, intending to go back to Chicago, but after getting as far as Niobrara, his condition was such that it aroused the sympathy of kindhearted people. He had no shoes, and his flesh was visible through many rents in his scanty attire. He found work, which he gladly accepted, and remained for a year in the vicinity, herding cattle and saving up his money to buy proper clothing to wear on his journey home. He reached home in due time, and some time later went into business for himself, running a grocery store, which he disposed of in 1885, In 1885 he returned to Niobrara and engaged in the general merchandise trade, being very successful in this venture. Later on he established an implement house, handling, in addition, wagons, buggies, etc., to which he has also added a good line of harness and furniture. He has one of the most complete undertaking establishments in this part of Nebraska. His entire business enterprises are established on a sound foundation, and conducted along strict business lines, he devoting his personal attention to the details of his business, and richly deserves, the success which has come to him. Mr. Opocensky was married at Verdegris, on September 19, 1886, to Miss Anna Tonek, who was born and reared in that place, and is a daughter of Bohemian parents. Their marriage was one of the most notable celebrations ever held in the county, being unique in that all the children of the Tonek family, three in number, left their parents' roof on the same day, the only son being married, also the two daughters, making a triple wedding. All the old country customs were practiced at the happy event, the festivities extending through three days. Mr. and Mrs. Opocensky are the parents of four children: Martha, who assists her father in his stores; Othelia, graduate of the high school here, and later completing a course in Burrows Business College in Omaha, and is now also in the store; Frederick, the eldest son, graduated from Niobrara high school in 1909, and from the Wentworth military academy at Lexington, Missouri, in May, 1910, and is now assisting has father in the store; and Edward, who is still a student in the city schools. Politically Mr. Opocensky affiliates with the republican party. He is a prominent member of the Masonic fraternity, the Woodmen of the World, and Bohemian Benevolent Order Z. C. B. J.
Randall Fuller, who was one of the very earliest settlers in Fullerton, Nebraska, died in that city on February 26, 1901. Mr. Fuller was a native of Vermont, born in Shaftsbury, in 1823, being at the time of his death seventy-eight years of age. interesting family relic on exhibition in the museum at Plymouth Hall, in the shape of an old-fashioned cradle used for generations in the Fuller family and finally bequeathed to that institution by them. Also, the names of different members of the family will be found engraved on the monument at Plymouth Rock, Massachusetts. When Randall was but three years of age, his parents moved to Ohio, and two years later settled in Michigan, remaining there until he was about fourteen years of age, then they went to Wisconsin, that territory not having as yet reached its statehood. There our subject was educated and followed farming during his time away from school. In 1849, at the time of the rush to California, during the gold excitement, Mr. Fuller in company with two men, drove the entire distance from Wisconsin across the plains to the Pacific coast; traveling by wagon train. They were joined along the way by others in the same mad hunt for wealth, and by the time they reached their destination, there were one hundred and fifty men in their party. After three years of hard work, hope and discouragement alternating, our subject gave up the struggle and returned home, full of exciting stories of adventure, but not very much richer for his experience. Still, he was not satisfied, and the following spring headed another wagon train bound for the same goal, and later was the chief moving spirit in starting other parties across the plains in their search for gold. In 1877, Mr. Fuller came to Nebraska, having passed through the state several times in his travels, and made settlement in Fullerton, being practically the original founder of that city. He was prominent in every movement made for the advancement of the place, and has always been a leader in all affairs of his county and state. Personally he was a man of fine character, straight-forward and honorable in all his, dealings, and was greatly loved by all who knew him. At the time Mr. Fuller first located in the vicinity of Fullerton, he had stopped only temporarily, being at the time on his way to Colorado with a herd of cattle, where he intended locating a ranch. At this time he was following the old Mormon trail, which was familiar to him, as he had frequently been over it in conducting parties to California. While here he heard that Nance county, which was then the Pawnee Indian reservation, was to be put on the market and sold for the benefit of the Indians. So Mr. Fuller decided to remain in the locality, which he did, and when in 1880, the land was thrown on the market, Mr. Fuller purchased two thousand and two hundred acres, mostly water front, and thought to establish a ranch, not realizing the value of the land for agricultural purposes. The county began to settle so rapidly that Mr. Fuller realizing the necessity of a trading point and post office, and later a county seat, platted eighty acres of his farm in town lots; at first gave away a business and residence lot to those who would build. When the location of the county seat was made at Fullerton on a vote, Mr. Fuller gave sixty acres, which were sold and the money used to build the court house and he also furnished the site for the building. He also furnished all the sites for the churches. On the land which Mr. Fuller purchased at first was located a forty acre tract of oak undergrowth. He watched this tract very cafully, keeping out the prairie fires, which were numerous in the early days, until the underbrush has grown into a forest of fine oak trees. The bluff, with a drop of two hundred and eighty-three feet, is located in this grove, being in the early days known as Buffalo Leap and later as Lover's Leap, the latter name coming from an Indian legend concerning a Pawnee chief and his sweetheart, who jumped to death at that point. In 1897, Mr. Fuller gave the use of these grounds for the purpose of holding chautauquas, and this has grown to be one of the most popular and largely attended of any in the state, lasting from ten days to two weeks and known as the Fullerton Chautauqua. The bluffs on the south keep out the prevailing hot winds of August, and this is one of the coolest and most comfortable places to he found in the state during the hot months. Most of those from abroad who attend the chautauguas camp on the grounds. Boyd county has been largely settled by citizens from Holt county, who crossed over the Niobrara after the opening of the reservation in 1891, and of this exodus of sturdy citizens, C. A. Kibby, of Naper, is one. Mr. Kibby is an Illinoisan by birth, that event having taken place at Dundee, Kane county, January 14, 1847. His parents, Abraham and Olive (Tracy) Kibby, came from New York to Illinois in 1835 and settled in Kane county, where the mother died in January, 1878. After her demise the father continued to live in Kane county, until 1883, after which he made his home with a daughter at Georgetown, Colorado, where he died in 1885, and whence his body was borne to rest beside that of his life's helpmate. Robinson, where he was given a hearty welcome and a good meal, and never in his life did a dinner taste better, than in this hospitable house in the wilderness. The friendship formed that day was never broken, and often afterward did he sit a welcome guest at the Robinson's well-laden board. Mr. Kibby settled on the strip of land between the Niobrara and Keya Paha rivers, about ten miles west of their confluence and moved onto the land the 29th day of June. Mrs. Kibby's brother-in-law living here had oxen but no horses, so he employed his neighbors who were better equipped to go to Stuart to bring the family and their belongings to the new home. Mr. Kibby bought a mule team in the fall and broke seven or eight acres, from which he secured a good crop of spring wheat the following year, running nineteen bushels to the acre. Some of this he traded at Eagle Mills for rye flour, giving them an abundance of bread for the coming year. But a series of dry seasons followed in which little was raised, and many of the settlers abandoned their claims, and left their fields to return to the prairies or grow up in sunflowers. There were only scant crops from 1885 until 1891, since which time, bountiful seasons have prevailed, to the present day, excepting the excessively dry year of 1894. Mr. Kibby lived on his homestead for thirteen years, except a short time out of the state. In December, 1891, he migrated to Missouri, settling in the central part of the state, but finding it uncongenial, he returned to Nebraska the following March. In 1896, Mr. Kibby raised three hundred and fifty dollars on his land and removed to Wayne county, four and one-half miles northwest of Wayne, and in the spring of 1907, returned to Boyd county again and became a resident of Naper, which has since been his home. He has engaged in freighting between Spencer and the railroad, at first to Anoka and since October, 1907, from St. Charles, making from four to six trips a week. Mr. Kibby was married August 15, 1871, to Miss Elizabeth Wolf, the daughter of Jacob and Mary (Bonnell) Wolf. Her mother died in Iowa, and her father in Kansas some years after the demise of his good wife. Four of the children born to our subject and his wife are living. They are: May, wife of William F. Green, a prosperous photographer in Naper; Rollen J., who has a ranch on the Keya Paha river, nine miles from town; LeRoy, who is ranching south of his brother; and Jennie, one of the successful teachers of the Napier schools. Mr. Kibby had been a democrat until the year free silver became an issue, then he voted for McKinley, and he has since supported the republican party. He is a member of the Odd Fellows and the Ancient Order of United Workmen. The daughters are members of the Rebekah degree. Mr. Kibby, for part of the time he was on the ranch, lived in the comfortable "soddy" of the west; later he lived in a more modern frame house. Prairie fires often threatened devastation, but vigorous fighting he warded off the fiery danger. He once started a prairie fire uninentionally, it getting away from him through the corner of the breaking which he was intending to burn. Considerable damage was done by the accidental conflagration, but he escaped any serious consequences. Mr. Kibby occupies a comfortable cottage in the southwest part of town, and finds the strength to carry on his strenuous occupation, fearing neither heat nor cold when business calls him to take the road. He has a good team and fine equipment for his work, and gives promise of many years useful labor before the infirmities of old age cause him to retire. Among the many sons from England's soil who came to America in the early days of western pioneer pilgrimage, and who have given of their strength and fortitude, is Alfred Clark, the above named gentleman. Alfred Clark, son of William C. and Sarah (Wanstall) Clark, was born in England, county Kent, June 29, 1858, and was the youngest in a family of nine children. In 1867, he came, with his father, mother, three brothers, and the mother's sister, to America, locating in eastern Iowa, where he received his education and later engaged in farming. On December 1, 1880, Mr. Clark was married to Miss Josephine Galyean, a native of Delaware county, Iowa, and in the spring of 1884, came to Boone county, Nebraska, and homesteaded one hundred and sixty acres of land in the southwest' quarter of section four, township twenty, range seven, which remained the home farm until 1901, when he retired from active farm life and moved to Albion, where he bought a good home in which he now lives. Mr. Clark has been prosperous and successful, and in 1903 purchased another farm in Boone county. He served for several years on the school board of district number forty, in his home county. Mr. Clark's father died in March, 1903, and his mother, on December 25, 1894. He has one brother in England, one in the state of Washington, one in California, and another in Albion, Nebraska, a sketch of the latter appears in another part of this biograpbleal history. Mrs. Clark's father died in May, 1910, and her mother is making her home with her children. Two sisters and one brother reside in Albion and another sister resides in in Loretta, Nebraska. Hazel and CeciI living, and Willis, who died in infancy. Mrs. Alfred Clark have been active in church circles for the past twenty-five years, and were among the organizers of the first Sunday school in their district about 1887; later Mr. Clark was superintendent of the same school for several years. They have passed through all the discouragements and hardships incident to pioneer life and are widely and favorably known. Our subject's father, William C. Clark, was born in England, July 21, 1819, and when he grew to manhood was engaged in milling, doing his grinding by the aid of windmills. On December 25, 1843, he was married to Miss Sarah Knott Wanstall, who was also a native of England. In 1867 he came to. America with his wife, four sons, and his wife's sister, Mary Wanstall. They located in Delaware county, Iowa, on a farm, where they lived a great many years, then retired and moved to Earlville, Iowa, and it was at this place that Mr. and Mrs. Clark died, December 25, 1899. Nine children had been born to them, four of whom are deceased. One son resides in England, one in the state of Washington, one in California, and two sons reside in Albion, Nebraska, one of whom is the subject of this sketch, and the personal history of the other son, Henry, appears in another portion of this book. On April 14, 1896, William C. Clark was married a second time, the bride being Miss Mary Wanstall, who was born in England. Mr. Clark died in March, 1903, survived by his widow and five sons. His widow is living with the son, Alfred Clark, in Albion, at the advanced age of ninety-two years, and this has been her home since the death of her husband. York state has given its share of sturdy, progressive men to the settlement of the west, and among them, one of the most prominent is Henry Kellogg, a retired farmer, living in Wayne. He was born near Pen Yan, Yates county, New York, on June 21, 1851, and in September of that year, his parents, George W. and Mary L. (Owen) Kellogg moved to Huron county, Ohio. They lived there for only about a year or two, and then pushed on, settling in Hillsdale county, Michigan. The father died here in 1860, leaving the mother to rear her little family. She married again later and moved to Iowa, where she died. Young Henry grew up to manhood in Michigan, and began farming on a rented farm there. Early in June, 1874, he reached Saunders county, Nebraska, and for the first year lived on a rented farm. He bought eighty acres near Wahoo, which he broke as soon as possible, and in the fall of 1875, built a house on his own land, Saunders county being his home for seven years. In May, 1881, he moved to Wayne county, and bought one hundred and sixty acres about four miles east of Wayne. From time to time, as circumstances warranted, he added to this purchase, until at the time of his retirement in the spring of 1902, he was the owner of four hundred and eighty acres of well improved land, most of it under cultivation. When he retired, Mr. Kellogg purchased a comfortable dwelling near the center of Wayne, and here, with his good wife, he is enjoying a rest from the active labors of the past. Mr. Kellogg was married in Hillsdale county, Michigan, on October 12, 1871, to Miss Zella Koon, a native of that county. Her parents, like Mr. Kellogg's, were from New York state, her father being born at Watkins Glen, where his father had been a well known blacksmith in those early times. Mr. Kellogg's people had figured in early history of the country, his grandfather having participated in the battle of Niagara, in the war of 1812. Seven children have: been born to Mr. and Mrs. Kellogg, six of whom survive: Mary, the wife of Warren Bishop, lives near Medford, Oklahoma; Charles is farming near Verdel, Nebraska; George and Frederick are farming in Knox county, Nebraska; and Martin and Walter are both farming in Stanley county, South Dakota. Ralph died when about two years old. Mr. Kellogg endured the privations, and passed through all the vicissitudes of an early settler's life on the western prairies, and has done well his share in winning the wilderness for civilization. No better citizen can be found in the state, and he enjoys the respect of a large circle of friends and acquaintances. The gentleman whose name is at the head of this personal history, is the proprietor of one of the most valuable estates in Pierce county, Nebraska, and has been a resident of that locality for twenty-five years. He is prominently known throughout Pierce county as one of the foremost farmers and stockmen in his home county, and after many years of hard labor in building up his farm, is now prepared to enjoy the remaining years of his life in peace and comfort, surrounded by a host of good friends and acquaintances. Mr. Siem is not content to sit idly by, however, and still looks after his farm. Mr. Siem was born in the village of Henstedt, Holstein, then a province of Denmark, February 6, 1835, being the son of Claus Siem, who died at the age of fifty-six. The mother was Miss Christina Mueller, who died in the old country at the age of seventy-four. Our subject served Denmark in the army from 1858 to 1859, and was called to the army to defend the country against Germany in 1864.
ary, 1867, he was employed at farm work near Momence, Kankakee county, Illinois, then returned to the old country, where he owned a farm of eighty acres, a very large estate in the old world. During this year in America, he became interested in the girl who has been a factor in his life ever since. In 1880 he returned to Illinois, married and again crossed the water to his landed estates, expecting to pass his days in the fatherland. However, this was not to be; Mrs. Siem, having lived since early childhood in America, was not contented in a foreign land, so in 1882, Mr. Siem sold his farm, and for a fifth time crossed the Atlantic, sailing from Hamburg in the "Lessig," the same vessel on which he had crossed two years before. On coming to America the third time, Mr. Siem settled in Douglas county, Nebraska, and rented for four years near Omaha. In 1886, he came to Pierce county, and purchased the northeast quarter of section eleven, township twenty-eight, range four, to which he has added one hundred and sixty acres in section ten, and on eighty-acre tract in section three. On the first tract he built a frame house and set three acres of trees, which now surround the dwelling and orchard and garden. Our subject was out in the blizzard of January 12, 1888, most of the afternoon, seeking his cattle, of which he lost ten head. The storm was so blinding and suffocating that it was with great difficulty he finally made his way home. July 29, 1880, Mr. Siem was married in Kankakee county, Illinois, to Miss Helen Deerson, who was born in Germany and came to America with her parents when she was five years old. Mr. and Mrs. Siem have three children: Helen, wife of Claude Stimson of Perkins county, South Dakota, and Peter and Hannah, still under the parental roof. In 1908, Mr. Siem remodeled his house, making an imposing fourteen room dwelling, probably the finest country residence in northeastern Nebraska. The view down the front driveway from the road is most imposing, with a fine three acre grove on the left hand, and a thrifty, growing orchard of equal area on the right. Nor is appearance all, pleasing as this may be, for the appointments are superior to most city homes. Soft water, hot and cold, is supplied to the bath room and other parts of the house, the submerged tank system being used. A gas motor used for forcing the water into the tank also supplies motive power for the separator, the churn and the laundry machinery. A furnace keeps the entire house comfortable in winter, and in the well furnished double parlors, with the fine piano, western hospitality is dispensed with generous hand. A full page view of the place, with its numerous barns and outbuildings, is to be found elsewhere in this work. Mr. Siem is highly respected by all who know him, and in religion is of the German Lutheran faith. Should you ask his political views, he will tell you he is a republican, good and strong, and has been ever since becoming a permanent resident and citizen of the United States. 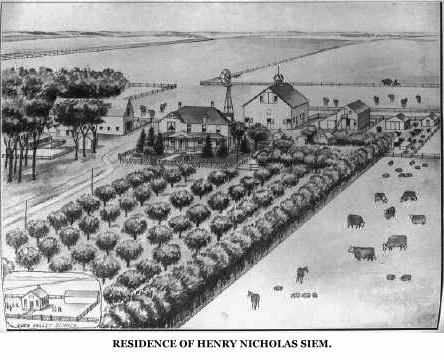 Residence of Henry Nicholas Siem. August Raabe, one of the most prominent and influential farmers in Stanton county, Nebraska, resides on section twenty-six, township twenty-three, range one, and is one of those substantial citizens whose integrity, industry, thrift, and economy have added so much to the material wealth and growth of Nebraska. Agriculture forms the basis of wealth in that part of the country, as, indeed, in most sections of the United States. It is therefore of the greatest, importance that the class of people who inhabit the great farming regions of the country should represent those elements of sterling worth which were prominently displayed by the majority of the early settlers and their descendants. Mr. Raabe was born in Wisconsin in 1857, and is the son of Robert and Minnie Raabe of Brandenburg, Germany, who had come to this country the year previous to his birth. When the subscriber was only seven years old, his parents decided to come to the real west, where they could get land cheaply and would find it easier to give their children the start they desired. So they drove their yoke of oxen from Wisconsin to Nebraska, where they took up a homestead and built a sod house. Later, this dwelling was replaced by a log house, to be succeeded in turn by one of more modern construction. At this time, the early settlers frequently secured fresh meat by shooting a deer or an antelope, for these animals were plentiful. Their postal facilities could not be called excellent, however, for their nearest postoffice as well as market, was Omaha, and it took three weeks to make that trip. However, they persevered, and at last reaped their reward. In 1884, Mr. Raabe was united in marriage to Miss Bertha Prawitz, of Stanton, who was also born in Wisconsin. They are the parents of eight children: Ida, Herman, Amil, Pauline, Walter, Martha, Arthur, and Lawrence. Mr. Raabe is one of the leading citizens of the county and has been so closely identified with agricultural, interests in that locality, that a history of its development would be incomplete without mentioning his labors here and the pioneer experiences which he passed through. the present fertile state, and taken, an active and leading part in this transformation. He now resides on section four, township twenty-five, range eight, Antelope county, where he is highly esteemed by all who know him. Mr. Dickerson is a native of the state of Ohio, born near West Bedford, Ohio, March 18, 1844. His father, Elijah Dickerson, was also born near West Bedford, Ohio; his mother, who was Elizabeth Akers, was a native of Ohio, born in 1819 and died in 1870. Our subject moved to Iowa, where he lived for twenty-eight years, then came to Antelope county, Nebraska, April, 1880. He drove from Iowa to his homestead in Antelope county, locating on section twenty, township twenty-three, range eight. There he built a sod house and "batched it" until 1884, when he sold his farm and bought the Waverly hotel in Neligh, remaining there six years. He then bought eighty acres of school land, but retained this but a short time, when he sold and went to Elgin to reside, purchasing a livery business, and later sold this, going back to farm life, and is now located on section four, township twenty-five, range eight. Mr. Dickerson has divided his time between business life and farming to such an extent that he is now content to settle down in life as a farmer, and he is well known in his community as a popular, substantial citizen of his locality. Woods Cones, one of Nebraska's old settlers and substantial citizens, first came to this state in the fall of 1870, his father having bought land the year before. They remained in Pierce two months and returned to Iowa, making frequent trips to this region until 1882, when they made permanent location in Pierce. Our subject opened the first bank in Pierce county, Nebraska, in the spring of 1882, which was known as the Pierce County Bank, Cones & Spencer being the firm name. In 1890 the bank was chartered as the First National Bank of Pierce, and in 1897 surrendered its charter and reorganized as the Pierce County Bank under the state law. In 1870 Mr. Cones became interested in a large cattle ranch three miles north of Pierce, disposing of this in 1897. Besides banking Mr. Cones is largely interested in buying and selling farm lands and farm loans. Mr. Cones was born in Iowa City, Iowa, October 17, 1858. He attended college at Grinnell, and Mount Vernon, Iowa, and graduated at Illinois college at Jacksonville in the class succeeding W. J. Bryan, with whom he was well acquainted at the time. After graduating, Mr. Cones entered his father's bank and helped him establish the first bank at West Point also the first at Wisner, Nebraska. Mr. Cones' father, William Cones, was a native of Cincinnati, Ohio, and was the first in the family to engage In banking. Our subject was first married in Indiana to Miss Mary Hayes. His second marriage occurred in Pierce to Miss Ida Ulrich. They have one daughter, Lorinda. Mr. Cones is a democrat, and is affiliated with the Masonic lodge at Pierce, is a charter member of the Knights of Pythias at Pierce, and of the Elks of Norfolk. James H. Welsh makes his residence on section twenty, township fifteen, range ten, about one and a half miles northwest of the city of St. Paul. He is one of the well known and deservedly esteemed men of his community, an old settler in the county, and by his faithful efforts to improve his circumstances and advance the growth of his locality, he has placed himself among its prosperous and worthy citizens. Mr. Welsh was born on May 16, 1866, in Huron county, Canada, and was the eighth child in a family of nine. At the age of five years his parents moved into Michigan, settling in Sanilac county, and after two years in that vicinity the father came on to Nebraska, arriving in Howard county on April 23, and filed on homestead rights. After several months he sent for his wife and children, they coming on October 16, 1873. They followed farming on the original claim for five years, then purchased over four hundred acres of good land on the North Loup river bottom, which the father cultivated up to the time of his death in May, 1880. He left a family of six children: they keeping on with the farm work after his demise, and succeeded in building up a very fine estate. James H. Welsh remained in Howard county until he was twenty-two years of age, at that time going to Manitoba, Canada, and spending two years in that vicinity. From there he went to Montana and lived for two years, and then to Colorado for one year, and his next location was in Arizona where he spent some time. In fact, he has spent considerable time in nearly every one of the western states, and is thoroughly familiar with the entire country west of the Mississippi river, also living in the Black Hills country in South Dakota. section. He is a good neighbor and a representative citizen, progressive and always alive to the best interests of his community. Mr. Welsh was married on September 7, 1886, to Rachel Herbertson, at the home of her parents near St. Paul, they being pioneers of this region, where he was reared. Three children were born to them, two are now living, being charming young women, and reside in Denver, Colorado. Mr. Welsh and his entire family are well known throughout this region, and all have done much toward the upbuilding of the locality. Among the prominent farmers in Valley county may be numbered Denzil A. Stewart, who is the owner of a fine farm, comprising four hundred and eighty acres of land. His farm is best adapted to raising grain, although he gives considerable attention to the raising of fine stock. He is counted among the early settlers of this county, having resided here most of the time since 1873. Mr. Stewart was born at Milton Junction, Rock county, Wisconsin, on November 18, 1859, and was the younger of two children born to William and Mary (Barker) Stewart. The father died when Denzil was only two years old. The mother, later on, married Jahoil Taylor. In July, 1873, Mr. Taylor, with his wife and family, removed to Valley county, Nebraska, taking up a homestead on the northeast quarter of section twelve, township seventeen, range fourteen. Here Mr. Taylor died in December of that year. The widow, with her two children, lived on the homestead until they proved up on same. She died September 30, 1890. The homestead farm is now owned by Denzil, and, with the exception of nine or ten years, when he was engaged in the mercantile business in Horace, Greeley county, it has been his residence continuously. Even during this period, the farm was managed by Mr. Stewart or some member of his family. At the time that the step-father, Mr. Taylor, took up the homestead, he was the first settler in this portion of Valley county. Their home was the first frame house built in the valley, and the lumber for it was all hauled from Grand Island, sixty miles away. On January 31, 1886, Mr. Stewart was married to Flora Thompson at the home of her father, John Thompson, in Davis Creek township. Mr. Thompson is also one of the older settlers, having come alone to Valley county in the fall of 1879, driving from Breckenridge, Missouri. He was joined by his wife, who was Millie Wright, and family the next spring. Mr. and Mrs. Stewart have three daughters and one son, as follows: Sunshine A., now Mrs. Lawrence Bright, of Ord, Nebraska, who has one daughter, Mavis; Noble; Maud, married Floyd Whitney, of Sumpter, Nebraska; and Gladys. In common with other pioneers, Mr. Stewart passed through many discouraging years in the early times, losing crops by the grasshoppers and droughts. In 1894 nothing was raised, not even as much as the seed. But he has passed the ordeal, and is now reckoned among the most successful and prosperous farmers of the community. He and his family are prominent in all social affairs of the neighborhood, and enjoy the respect of a wide circle of friends and acquaintances. He is independent in politics, and is a member of the Modern Woodmen of America. During the blizzard of January 12, 1888, Mr. Stewart was seven miles from home, and was compelled to remain overnight. On section nine, township twenty-one, range four, of Madison county, Nebraska we find another of the prominent old-timers of that region in the person of B. K. Melland, who is a prosperous farmer and stockman, well known throughout the county as a progressive, public-spirited citizen, and enjoying the respect and esteem of all who know him. Mr. Melland is one of the sturdy sons of Norway, born March 25, 1856, and is a son of Christ and Mary Olson, who were respected tillers' of the soil of that country. Our subject left his mother country, and embarked at Stavanger for the United States on a steamer, arriving in New York City after a rather hard voyage of two weeks on the sea. He came directly to Nebraska, and purchased ninety acres of railroad land in Madison county, which he rapidly turned into a productive farm. He has had the usual hard times experienced by all who came here to seek their fortune, but through it all has never lost sight of the fact that it takes patience and perseverance to win anything worth while, and, through constant hard labor and good management, has succeeded in surmounting what at times seemed hopeless obstacles. He has a finely improved farm, good buildings of all kinds, plenty of stock, and pasture land for the same, also raises fine crops of grain annually. Mr. Melland was united in marriage in November, 1877, at his home in Norway, to Miss Tena Larson, and to them have been born six; children, named as follows: Christ, Lewis, Mary, Ole, Bertha and Johnnie. When Mr. Melland first landed in Madison county he had the large sum of twenty-five cents in actual cash, and it is nearly unbelievable to think of this and compare his present prosperity with that time.